The growing of these large trees, and container plants is a long term growing projects for nurserymen and this is reflected in costs. These larger trees may be either field grown and dug to order, or grown in containers or large grow bags. Farmers also used advanced trees for new windbreaks, to fill in gaps in existing windbreaks and as shade trees. A landscaper or gardener can add instant impact and structure to your garden with advanced trees. 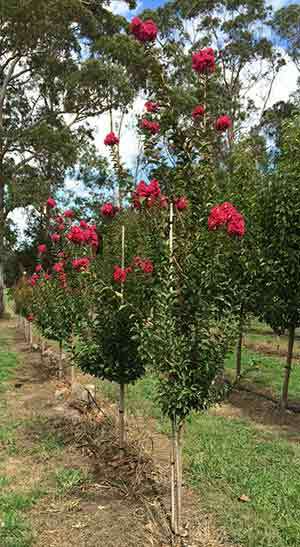 Many suppliers listed can supply trees nationwide. Another option is to obtain fully grown specimens that are transplanted from private properties. Residential and commercial property developers wishing to provide immediate impact, local councils who need to replace diseased or damaged trees. Landscapers working for schools or private home owners. Widely by the landscaping industry Advanced Trees provide instant impact. As they are bigger and older they will naturally cost more than smaller specimens, however in commercial developments the more established landscape can be cost efficient from a sales point of view. With a significant investment for Advanced and Established Trees it is essential that proper care is taken until the newly planted tree settles in and acclimatises to the location. Reputable nurseries will be able to provide you with a specific care regime, including preparation for planting, watering and fertilising. Advanced trees cans require a little more attention on planting, and through the first years of establishment, watering systems can be set up to ensure that these larger plants do as well as possible after planting. Although many Advanced Tree Nurseries are located close to major centres many are able to send large specimen trees interstate. So no matter if you are in Adelaide, Sydney, Melbourne, Brisbane, Perth or Hobart many growers can arrange for transport of large advanced trees. Transport costs will vary depending on distance, tree size, species and access. In many cases a ‘supply and plant’ service is available.